Hans Olaf Halvor Heyerdahl (1857-1913) was a Norwegian painter. His work was characterized by naturalism and focused largely on portraits and landscape paintings. Heyerdahl was born in Smedjebacken, Sweden. He was the son of Halvor Heyerdahl and Hilda Margretha Haak. His father was a prominent engineer and architect. In 1859, the family moved to Drammen, where his father took up the joint posts of city engineer and fire chief. He was educated in Christiania, where he studied with Gude pupil Peder Cappelen Thurmann and thus was introduced to Düsseldorfers style. Munich (1874-77) he studied with Eilif Petersen at the Akademie der Künste Bild and under Ludwig von Löfftz and Wilhelm von Lindenschmit the younger and in Paris (1878-1880). He also studied in Belgium and England and spent considerable time in Florence. Hans Heyerdahl distinguished himself as a technically very accomplished artist. At the World Exhibition in Paris in 1878 he received the gold medal for his work on Adam and Eve's Expulsion from Paradise. In the years 1878-82 Heyerdahl worked in Paris, where he was influenced by Léon Bonnat school, where open-air painting were key. Dying Children (1881) is another important work from this period. For this he was awarded the Grand Prix du Florence at the Paris Salon, a scholarship for a two-year stay in Florence. There he travelled in the fall and continued to live and work there until 1884. From 1884 Heyerdahl worked in Christiania, and he stayed there from 1885 until the turn of the century, every summer in Asgardstrand, where he was in contact with the younger Edvard Munch. 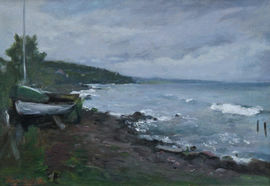 Heyerdahl became an important representative of realism in Norwegian art and executed portraits, among others Frits Thaulow 1885, found in the National Gallery as well as landscapes and several Nordic historical motifs. From the turn of the century Heyerdahl worked again in Paris, where this time he spent 6-7 years. He died in 1913 in Oslo, Norway.